The game of mythic mayhem. 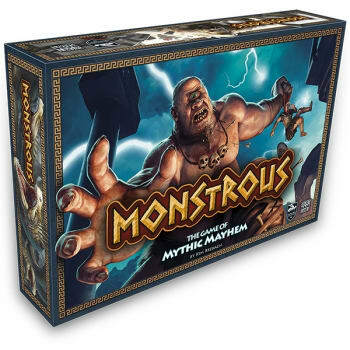 In Monstrous, players assume the role of Greek Gods, each with a team of Monsters at their disposal. And Zeus has commanded that they battle over ancient territory. By throwing monster cards from on high, they'll earn points, attack opponents, and control land. 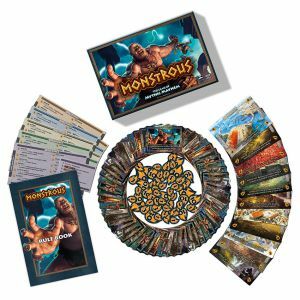 Monstrous is a quick dexterity game that incorporates a great deal of strategy. Players toss their monster cards to unlock monster and location powers and earn faith points. 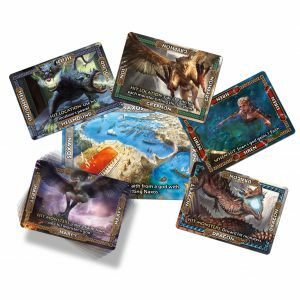 * Big Cards - The oversized Monster cards are thick, weighty, and ideal for throwing. Each deck is made up of beautiful illustrations of some monstrous mythological creatures. * Thinking Dexterity - A good throw is only half the battle as players will have to carefully consider what powers could be unlocked with strategic card placement. * Monster Party - Monstrous allows up to five Gods to battle for the favor of Zeus. 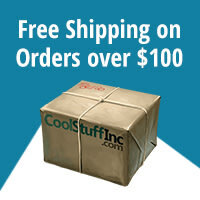 Its accessible rules and short playtime make it an ideal game for any situation.